Police Chief Don Bohon pins Richard Evans' Deputy Chief badge. On Feb. 1, the Police Department recognized the recent appointment of Richard Evans to Deputy Chief of Police with a badge pinning ceremony. Evans was appointed by Chief Don Bohon to Deputy Chief on Jan. 5. Evans is a lifelong Ponca City resident. He worked at Conoco for 8 years before deciding to start a career in law enforcement in 1992. He was promoted to Sergeant in 1998, Lieutenant in 2003, and Captain in 2017. He served in many different capacities along his 26-year career, including Tac Team Commander, Field Training Coordinator, Detective Lieutenant, and Detective Captain. “It has been an honor to serve the citizens of Ponca City during my career. Being a Police Officer has been very rewarding. The men and women who I have worked with are an exceptional group of people. 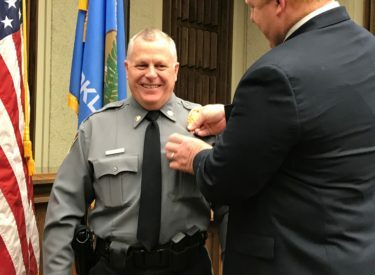 I am very excited to be appointed Deputy Chief of Police and am looking forward to continuing to serve the men and women of our Police Department and the citizens of Ponca City.” Evans said. His family includes his wife Jan Evans, six children, Krissy, Kayla, Kassi, Justin, Jerrod and Greg, and 10 grandchildren. Also present during his pinning ceremony was his stepdaughter Kayla Ramsey, her fiancé Michael Woodruff and daughter-in-law Brittany Evans.